This is a final sale item. There are no returns or exchanges. For details, please refer to our Returns Policy. Make the most of your fitness routine in this premium waist trainer from Amia. Designed to be worn while you work out, the Active Band Waist Trainer by Amia instantly slims your midsection while increasing perspiration at the same time. The garment comfortably slims 1-3 inches from your waist while you wear it, ensuring you always look your best at the gym. And, by giving you an instant glimpse of your slimmer figure, it helps to keep you motivated and on-track to your long-term fitness goals. The Active Band Waist Trainer embodies everything that Amia is known for: innovative approach to design and an unwavering attention to quality. It's made with a durable latex core that's specially designed to increase thermal activity and stimulate perspiration in your midsection, making it the perfect complement to your workout wardrobe. You can also wear the Active Band like a corset underneath other clothing for work or weekend-wear. No matter what the occasion, you're going to love how you look in the mirror. 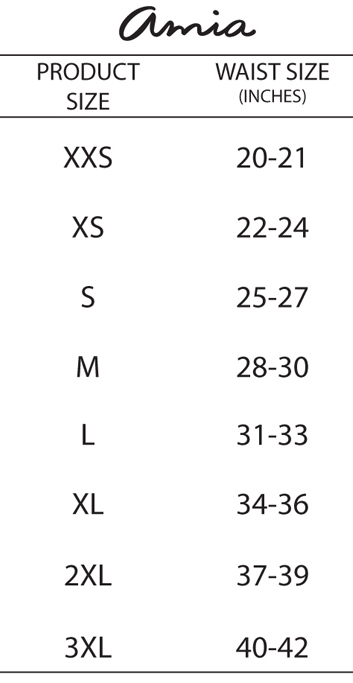 Size Chart: Find your natural waistline, dress size and hip size on the chart below to select the correct size for you. Your natural waistline is three fingers above your belly button. If you are between sizes, we recommend you choose the larger size.